Two reindeer brothers can enjoy the holiday season in peace after a health scare almost cost one his life—until a brotherly blood transfusion saved the day. In Shortsville, New York, about 30 miles east of Rochester, Moose and Little Buddy call a little farm home. Their owner, Mike Schaertl, was looking forward to Little Buddy’s first holiday season, but last month the five-month-old reindeer got very sick. Reindeer are vulnerable to tick-borne diseases, and living in areas where deer graze can increase the risk of infection. When Little Buddy lost his energy and had no interest in eating his favorite beet pulp or playing with Moose, concern grew. Schaertl called his veterinarian, Michael Carey, himself a reindeer owner, at the Towne & Country Veterinary Hospital, who right away referred him to the Cornell University Equine and Nemo Farm Animal Hospital. By the time Little Buddy arrived, his condition had worsened: He was lethargic and had a very high fever. 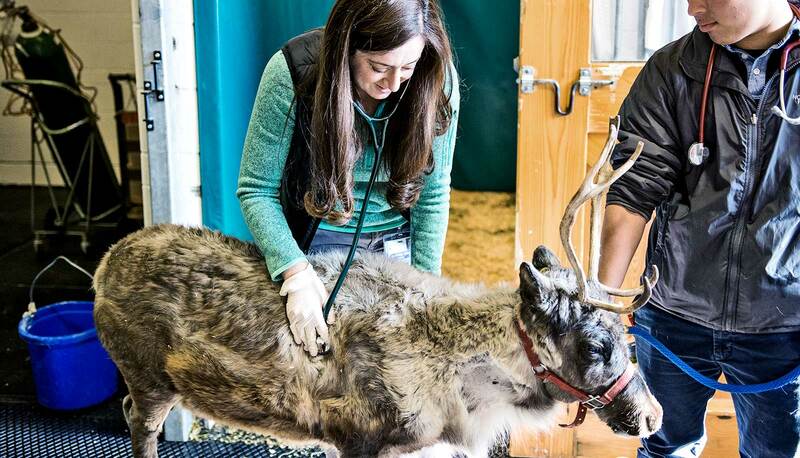 Melissa Fenn, a large animal internal medicine resident, began stabilizing him immediately with oxygen and fluids. Initial bloodwork diagnosed Babesiosis, a potentially fatal parasitic disease spread by ticks. The parasite was destroying Little Buddy’s red blood cells, making him severely anemic. Fenn and her team ordered medication to combat the parasite and monitored him closely overnight in the intensive care unit. Despite their efforts, the next morning Little Buddy was significantly more lethargic. Because of his anemia, there was an inadequate amount of oxygen being delivered to his tissues, a problem requiring a blood transfusion. Things were not looking good. “We were very worried about Little Buddy. 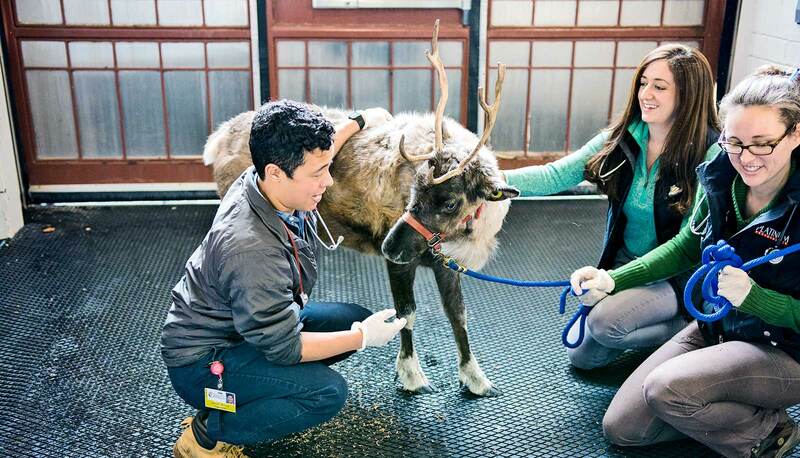 Most reindeer that present to the hospital with this disease do not survive,” says Fenn. Moose had traveled with Little Buddy to the hospital. 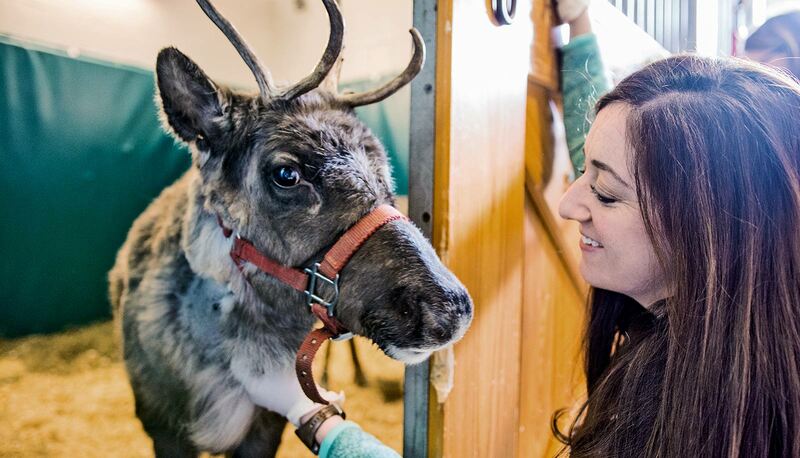 Reindeer are social creatures who gain comfort from being in their herd, so Fenn knew that bringing in Moose, Little Buddy’s herd-mate and half-brother, would ease his stress. Moose could also donate blood Little Buddy needed for a transfusion. A day and a liter of blood later, Little Buddy could stand and began to eat again. Although still very sick, the young reindeer continued to show signs of improvement. By the sixth day, Little Buddy could play with Moose again, and his bloodwork results were looking better. He no longer needed oxygen and could be moved out of the ICU. 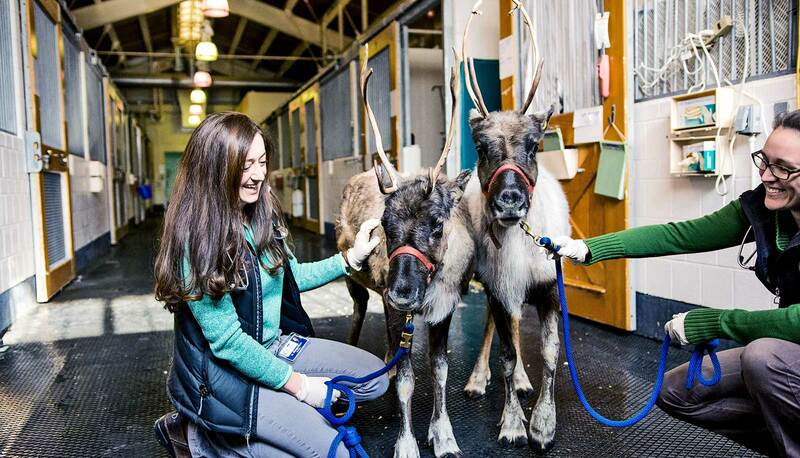 The Cornell University Equine and Nemo Farm Animal Hospital is equipped to keep many species of large animals, though special consideration was needed for Moose and Little Buddy. For example, bars and grill work on equine stalls would present some hazard to reindeer antlers that could get stuck. The hospital retrofitted a padded stall normally used for horses with neurologic conditions, closest to the end of the barn, where the door could be opened to let in cool November air. Little Buddy needed cold temperatures to be comfortable, so large box fans were hung in the stall. After a week, it became clear Little Buddy would make a full recovery. The treatments, including Moose’s blood transfusion, had worked. He was more energetic, interactive and there was no longer any evidence of the organisms that made him sick. Fenn was thrilled that her patient had pulled through the worst. 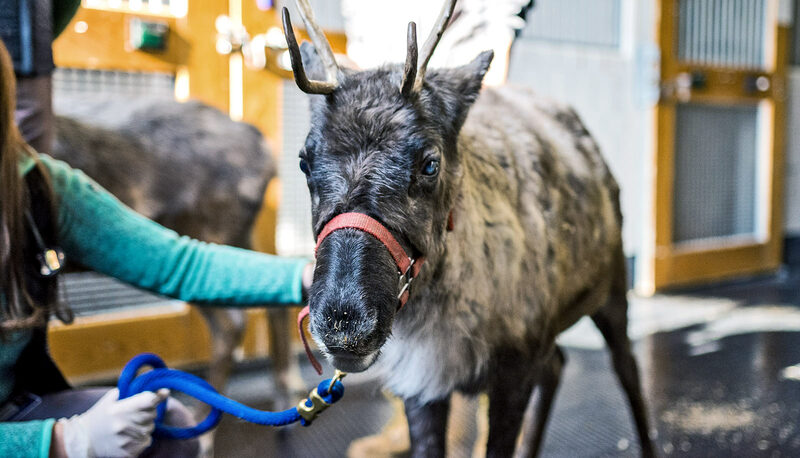 After more observation and treatment for an unrelated eye issue, both reindeer were discharged with a clean bill of health. Schaertl reports that the brothers are happy as ever at home. The family threw a party in the brothers’ honor, a barn-warming celebration with several hundred guests. Could a blood test measure pain?